USM-R Model - Black body surface create a simple and stylish look. A device is easily recognized automatically when you connect it to a USB port. Power will be supplied through the USB port, without the need for an AC adaptor. The Sony Micro Vault 16GB USB flash drive comes with a unique design in a single piece that is instantly noticeable. It comes with a retractable USB connector that lends protection to the USB connector without the need of an external cap. The connector keeps the flash drive well protected against damage and dust. The design is not only functional, but also stylish and easy to use. You can easily slip this compact flash drive in your pocket without feeling uncomfortable about its weight and size. The LED provided on the flash drive illuminates to indicate data transfer activity. This USB 2.0 Sony 16GB USB flash drive model comes in an attractive colour. 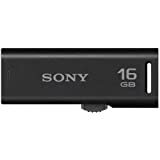 The 16GB USB flash drive from Sony is a powerful performer with high speed USB 2.0 interface that enables quick transfer of large files. The Sony flash drive is also backward compatible with USB 1.1 port. Transfer of video and audio files from and to the flash drive can be done with great ease with the plug and play installation feature. The flash drive is compatible with Windows 7, Windows Vista, Windows XP and Mac OS 10.1-10.6.x operating systems. You cannot use it for Linux based systems though. Back-up of data with the Sony Micro Vault Classic is a breeze.